1. Pallas ruled by Jupiter which is quincunx Pluto and trine South Node. 4. Fourth House ruler Uranus square Pluto. 5. Sun ruler Jupiter quincunx Pluto. 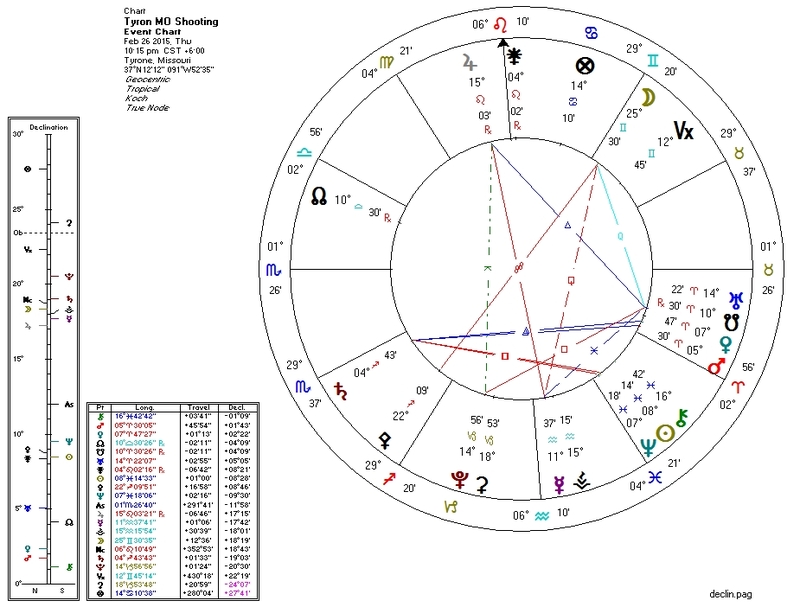 Not very strong (especially the Moon / Fourth House connection). Hence not much concurrent violence. Libertarianism, the focus of this astrology blog, is based on the ethic of non-aggression. Pallas is the planetary ruler of this ethic, and is the focal point of this astrologer's voluminous, chart-intensive research. When Pallas or her sign ruler is weakened (by Pluto, the South Node, and/or discordant aspect from Jupiter), the non-aggression principle is weakened. Then, reflecting other factors in the sky, varying types of aggression tend to manifest in the world. Note that most of this chart is practically identical to the chart of yesterday's largely secret "Net Neutrality" ruling.